At Plum Street Advisors we seek to build portfolios that will have not just strong returns, but strong returns for the amount of risk being taken. This focus on both risk and return is one of the reasons we hold an allocation to gold in our portfolios. While our gold allocation is modest – currently approximately 5% of the total portfolio – it is nevertheless an important diversifying component. Like salt in a recipe, a small pinch of gold goes a long way. Even well-diversified portfolios tend to have a significant stock bias. 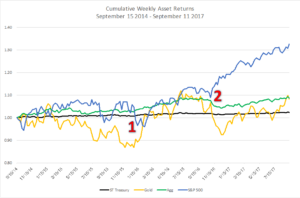 As an example, stocks as measured by the S&P 500 Index have had a negative total return for only four out of the last 20 years, and a balanced portfolio of 60% stocks and 40% bonds [*] has had a negative total return for those same four years. Over this period, bonds had a negative return for two years, and the 60/40 portfolio was positive for both of those years. In other words, even just looking at the data from the highest level, it is clear that a typical balanced portfolio tends to behave much more like its stock component. For many portfolios, as with the simple 60/40 portfolio, the stock bias results partly from holding a majority of assets in equities. But what is less widely discussed is that the bias is also the result of stocks being much more volatile than bonds and so, dollar for dollar, stocks have more impact on the portfolio’s return. However, in addition to the direction of an asset’s returns, we look at how much an asset moves in that direction. The stock market is very volatile. If an asset moves opposite to the stock market, but tends to move only by very small increments, then an allocation to that asset will dilute your returns, making downturns less painful, but it won’t do much to diversify returns and help to counteract a downturn. Bonds are only about a third as volatile as stocks, so it would take three times as many bonds as stocks to fully offset the volatility of the stock market. On the other hand, commodities such as gold are more volatile than stocks, so even a small allocation can make an important contribution to offsetting stock market swings. By this measure, gold is the better diversifier. The chart below helps to illustrate why gold can be a helpful diversifying asset. Notice that in early 2016 (illustrated with a “1” in the chart), the stock market got off to a poor start (The SPY ETF, representing the S&P 500, was down -10.3% by February 11th). Bonds did offset this negative return, but the bond ETF’s return[‡] through February 11th was only +2.1%, so it had a relatively small impact. Source: Returns are based on the following representative passive ETF returns: Short Term Treasury: SCHO; Gold: IAU; Barclay’s Aggregate Bond Index: SCHZ; S&P 500: SPY. The historical data are provided for illustrative purposes only. They assume reinvestment of income and do not reflect the impact of any trading or advisory fees. There are also limitations relative to comparative or other purposes because the ETFs have different material characteristics and varying volatility. Over the last few years, the stock market has done extremely well, and there have been few significant downturns. Gold and bonds have posted more modest returns over the past three years, but gold has done a better job of offsetting stocks. There is no guarantee that either gold or bonds will continue to be as negatively correlated, or be able to protect against a sharper stock market drop in the future. But we’ve been happy to see the gold positions in our portfolios helping to reduce overall volatility. We’ll continue to closely monitor how the market is behaving. [†] Correlation is measured from -1 to +1: a positive correlation means two assets move together, a zero correlation means they move independently, and a negative correlation means they move counter to each other.